The Hamilton Port Authority (HPA) has announced that Hamilton-based McKeil Marine Limited is the recipient of the 2013 HPA Environmental Excellence Award, recognizing the company’s dedication to environmental stewardship. McKeil Marine is a committed and enthusiastic supporter of numerous environmental initiatives aimed at protecting water quality, reducing fuel consumption, and trimming the carbon footprint of its marine fleet. McKeil was one of the first companies in North America to install a leading-edge fuel optimizing technology on three vessels in its growing fleet. The installation produced a fuel savings of more than 30%, along with significantly reduced pollution and CO2 emissions. McKeil has selected the Bay Area Restoration Council (BARC) to receive a $5,000 donation on the company’s behalf, provided as part of the award through HPA’s environmental trust fund. BARC has been a leading voice in the effort to restore and protect Hamilton Harbour since 1994. 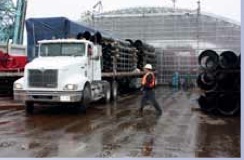 The Fuel Optimizing System, used by McKeil Marine to minimize the fuel consumption and air pollution and also maximize the ships’ profitability, was designed and installed by Pronova Systems Inc. of Laval, Quebec. “We applaud the vision of McKeil’s leadership, and the input of its knowledgeable team in helping customize the system that meets the needs of McKeil’s fleet, and produces excellent results,” said Stefan Stan, President of Pronova Systems.